Come enjoy the crisp and refreshing outdoors of Mount Pleasant, Utah. The resort itself offers many on-site amenities as well as countless outdoor activities in the beautiful natural surroundings. Nearby lakes and streams offer terrific trout fishing and thousands of acres of forests are just minutes away for hiking, big game hunting and some of the most breathtaking scenic beauty in the entire state. 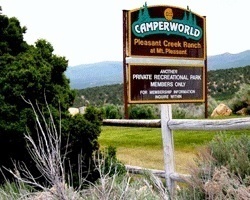 Membership includes second campground for Lakeside Park Camper World, Duchesne, Utah!